Water tower at Drawbridge, CA. Photograph courtesy Cecilia Craig. Copyright CC BY-SA 3.0. Shannon Barry, an education and feature writer for the Milpitas Post, has covered the ghost town of Drawbridge, CA in the August 24, 2012 print edition of her popular column "Sightseeing with Shannon". The article, available on the Mercury News website, is part of an ongoing series of profiles about activities and places of interest in the greater Silicon Valley. The full article (PDF version) can be downloaded here. Stan Olszewski, a freelance photojournalist, accompanied us on the tour of Drawbridge and took some wonderful photographs, some of which appear in the article. The full album can be seen at Stan's online photo-gallery. Thanks to Dr. Cris Benton, who runs the Hidden Ecologies blog, a project documenting the San Francisco Bay landscape with kite aerial photographs and photomicrographs. One of his photographs, an aerial view of Drawbridge, appears in the article. See his Drawbridge photo album on Flickr. Aerial photo of Drawbridge, CA. Photograph by Paguerra courtesy Wikipedia. Copyright CC BY 3.0. The U. S. Fish and Wildlife Service conducts a Drawbridge Van Excursion led by long time volunteer Ceal Craig on a periodic basis. Nestled on an island in the salt marshes of South San Francisco Bay, the town of Drawbridge once boomed and is a ghost town today. Attendees meet at the Environmental Education Center, 1751 Grand Blvd. in Alviso, to start with a slideshow of the town’s history before making the trip to view it across Coyote Creek. Attendees do not visit the town itself. Tour guide Ceal Craig takes attendees to the closest spot that one can legally view Drawbridge through spotting scopes at the Don Edwards San Francisco Bay National Wildlife Refuge. If you are interested in a tour of Drawbridge, the Wildlife Society has two of them coming up: September 8, 2012 from 2:00 pm to 4:30 pm and September 15, 2012 from 12:30 pm to 3:00 pm. The program is intended for adults and space is very limited. Reservations are essential. For more information or to reserve a spot, call Debra King at 262-5513, extension 102. You may read more about Drawbridge in Drawbridge, CA Re-turning the Tide by US Fish and Wildlife Service, and Drawbridge: A Ghost Town Revisited by John Steiner, Tideline Fall 2003. 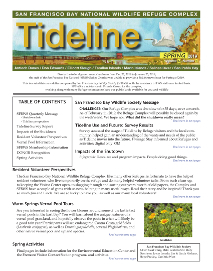 Tideline is a quarterly newsletter published by the Don Edwards San Francisco Bay National Wildlife Refuge, with funding from San Francisco Bay Wildlife Society.